The above info came from jonathan gruber, and was edited by yours truly (contact me). The image came from Amazon.com. Master Roshi takes Krillin, and Goku to a tournament that Emperor Chiaotzu had put together. The winner of the tournament would get to see the emperor, and get any wish by Emperor Chiaotzu. However, the emperor's wife, Ran Ran, gets kidnapped. Both Master Tao Pai Pai and Hermit Crane plan to overthrow the emperor by having the emperor collect all seven dragon balls under the guise that Shenron's wish can be used to find Ran Ran. Goku, as in the original series, has the 4-star dragon ball that he got from his grandfather. During the competition, Bulma, Launch, Oolong, Yamcha, and Puar try to steal the other six dragon balls. Unfortunately the six dragon balls accidentally fell in a lake near the palace. Goku also got sent all the way to where Korrin lives, and Korrin explains to Goku why he lost to Tao Pai Pai by putting the Goku's dragon ball into a container of water. He asked Goku if he could see it. Goku couldn't because of the ripples in the container. 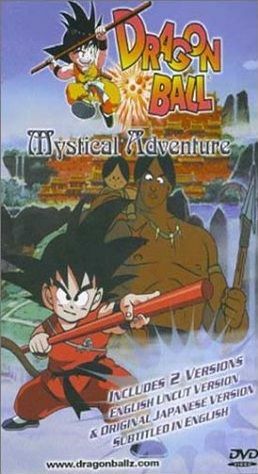 When Korrin put his staff in the container, Goku could see it. Goku does get a rematch with Tao Pai Pai, and if you need to know where the rematch was it's at Penguin Village and Arale and Gocham saw the whole thing.